Any Mori Girls on GT? I am curious whether anyone on this fine board dress in the style often called "Mori Girl"(I'm not sure if people call it different things, but that was what I used to call it). For those who aren't familiar with the style, the livejournal community lets you have a small glimpse of what it's like. Mori Girl is often part style, part lifestyle since a lot of the style is about evoking a feeling, and that feeling works with specific activities more than others. A long time ago in a Jezebel far far away, Jezebel skimmed the concept of the style. Not much has been said about it since then, while from my experience, Mori Girl has gained even more validity as a subculture since that article. If anything, it's very well-represented on etsy. I'd have thought after all this time, more would be said about the style. 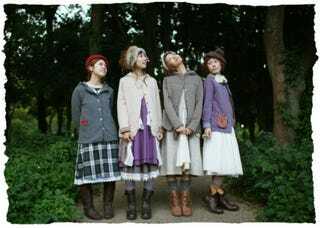 From a feminist perspective, Mori Girl style has a fairy progressive philosophy. It's goal is anything but appearing attractive to men, and the criticisms against it from the writer in the article on Jezebel is pretty much that he doesn't find it attractive and that it's popular for unattractive women (god forbid uggos like things, amirite? *rolls eyes*). Fashion, in it's essence, is about evoking a feeling and dressing to suit your lifestyle, and Mori Girl channels that essence in its own philosophy. If that essence doesn't mesh with the normalized image of femininity and attractiveness that some guys prefer, it's merely a casualty of dressing to suit yourself. My only gripe with the style is that some folks get too hung up on looking like the models in extravagant photoshoots instead of dressing slightly more practically, but that's just my own aesthetic coloring my opinion. I'd love to hear what other people on Jezebel who wear the style have to say about it.